Discipline is especially challenging when your kids catch you off guard, explode without warning or surprise you with new precociousness. Out-of-control kids are not a fluke of nature; out-of-control kids are the inevitable. Kids by their very nature make poor choices, do incredibly stupid things and either intentionally or accidently break many of the rules that keep them safe and happy. They either don’t know better or haven’t been taught differently. The first sanity condition of parenting is to plan for misbehavior – every child “misses” the mark of perfect behavior sometime. Discipline is sure to fail if you believe that discipline is only what you do in the crazy-making moment. Discipline is everything you do from the moment your child wakes up till the moment your child goes to bed, and quite possibly, the good night’s sleep you get or don’t get in between. Effective discipline strategies are always two-fold: how you manage the moment and what you do all day long. From now on when your child’s behavior is driving you crazy, look for at least two solutions. 1. Manage the moment, and 2. Look for the bigger picture. Values, problem solving and self-control are learned through practice and consistency over time. When your child or the situation gets out-of-control, be prepared to manage the moment. Experience helps you to match the best response to each situation. Cease and Desist: Be prepared to step in and stop the inappropriate behavior. This is especially important when safety is an issue: running with scissors, swinging the cat by the tail, sitting on your sister’s head. Assume a confident, I-mean-business voice and say with authority and conviction, “I will not let you _____________.” Follow with immediate action. This only works when you know you can and will stop the inappropriate action. Limits and Consequences: This strategy is used for situations where you guide your child, with the same kind of authority as earlier, to take responsibility for the misbehavior. You draw your child’s attention to the situation and clarify the better choice: e.g. “Walls are not for writing; bring the markers back to the table”. And adding a consequence, “Otherwise, art time is over”. 1, 2, 3, the discipline moment is over and done. This works for playing with food, playing catch-me-if-you-can at bedtime or being rude-n-sassy to grandparents. Avoid the power struggle: Parents can’t possibly win a power struggle without regressing into child-like behavior. As soon as you feel yourself sliding down to your child’s emotional level, change the rules of engagement. Stop speaking the moment you start repeating yourself or making empty threats. Instead, give yourself a time-out (“Mommy needs a minute before we figure this out”) or describe the problem at hand in neutral terms (“I know you don’t like waiting in long lines – let’s try to make it easier together”). 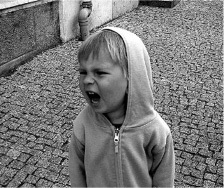 Choose your battles: If your child is in one of those interminable oppositional stages, everything is a battle. Pick one or two things that you want to work at a time. Otherwise, you are setting up your child to fail. Give-up the never-ending nagging and the impossible perfectionism. In other words, overlook the small stuff, particularly the kid-stuff like spilled milk or a little paint on the floor. Use humor: You really catch more flies with honey. So much of childhood misbehavior is testing – don’t take the bait. Your child learns the same lesson from silly parents as she does from serious parents. Do something unexpected – walk backwards to intercept the ketchup bottle that your child is emptying into the pool, speak Martian (it’ll get your child’s attention better than yelling), lay your head on the breakfast table and snore loudly instead of complaining that you’ll be late for school again. Choose the best action you can and stop grasping at straws: Discipline is both art and science but it’s also finding what works for you and your child. Desperation, however, never works. You’ll have plenty of time to re-evaluate your discipline strategies after the discipline moment. If you keep trying different tactics, your child will keep pushing you to more frustrating levels. Do your best and stand by the best you could do. That brings us to the skills and strategies that are taught outside of the discipline moment: rules, routines, communication, age-appropriate chores, problem solving, skill-building and teaching right from wrong. Look for these suggestions next month. Discipline gets easier when your child’s day is balanced, predictable and fun.